SBV, Phase Three ... high demand. Tourism Development and Investment Company (TDIC) of Abu Dhabi says the construction of Saadiyat Beach Villas (SBV), Phase Three, which comprises 77 luxurious residences, is on track for completion in June. All blockwork for the project was laid and completed this year and was achieved with over 2.5 million incident-free man hours logged since work began end of 2013, says an official. He says these villas, which were sold within a short time of their launch, reflect the continued demand and interest TDIC receives in the real estate market today. The Saadiyat Beach Villas comprise four- and five-bedroom villas available in Mediterranean-standard style, with built-up area of 4,833 sq ft and 5,834 sq ft, for each standard four-bedroom and five-bedroom villa respectively. Inspired by the desert and the Mediterranean, each home is characterised by outdoor terraces, stone veneers and detailed balcony railings while the interiors include spacious rooms, premium fittings and a vibrant colour scheme. Furthermore, residents can enjoy the community’s landscaped parks, play areas for children, swimming pools and terraces, state-of-the-art gyms, and basketball and squash courts. The community is also in close proximity to Saadiyat Cultural District. Red Sea Housing Services Company has reached a strategic alliance with Brazilian developer Direcional Engenharia to provide affordable housing solutions for Saudi Arabia’s rapidly expanding population. The alliance has resulted in the signing of two agreements covering technical services and a joint venture. Direcional Engenharia is a leading publicly listed company in Brazil that has built a reputation for delivering affordable homes under the country’s unique ‘Minha Casa, Minha Vida’ (My House, My Life) programme. In 2014, Direcional delivered an average of 1,540 homes per month to meet the needs of families throughout Brazil. “Saudi Arabia has emerged as a preferred destination for real estate investment within the GCC due to the large demand, particularly from the residential segment. We believe the need for affordable homes will grow at an unprecedented rate between 2015 through 2020 and beyond. In addition, we believe housing is one of the GCC’s most valuable market with estimated $495 billion worth of projects under various stages of construction,” says Ricardo Ribeiro Valadares Gontijo, managing director of Direcional Engenharia. Muraba Residences ... luxury residences. MPM Properties, the real estate consultancy arm of Abu Dhabi Islamic Bank (ADIB), has been selected by developer Muraba Properties as the exclusive sales partner for the Muraba Residences on the Palm Jumeirah in Dubai, UAE. Scheduled for handover in April 2016, the Muraba Residences commands a panoramic view across the Dubai skyline. It comprises 46 luxury apartments and four penthouses. The two- and three-bedroom apartments are available at prices starting from Dh4.8 million ($1.3 million), while the four-bedroom penthouses will be offered to the right profile of the buyer towards the completion of the project. Buyers at the Muraba Residences will enjoy luxurious amenities including private terraces, a swimming pool that overlooks the sea, as well as a world-class spa and gymnasium. MPM’s latest report on Dubai’s properties showed 15 per cent increase in sales values in the residential sector during 2014, while the fourth quarter saw quarter-on-quarter increase of four per cent. On the other hand, rental values grew 10 per cent across Dubai during 2014, but stayed flat during Q4 2014. Ras Al Barr Resort ... a rendition. 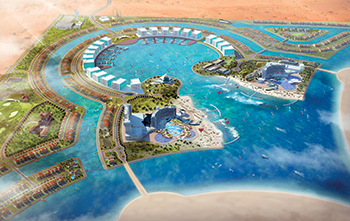 Leading design and project management firm SSH Bahrain has been awarded a contract for a prestigious resort in Bahrain by PK Development Company, an investment firm. The Ras Al Barr Resort is located in the south of the country and in close proximity to Ras Al Barr. The project will be developed on a total site area of 1,100 hectares, with approximately 440 hectares of reclaimed land. Phillips, and architecture director, Simon Dennison, leading the design team. The development will require both dredging and reclamation activities as well as subsequent development of the reclaimed land mass. The first phase is an open gated development and consists of three islands comprising of small to medium residential clusters, waterfront apartment blocks, suq, yacht club, four hotels, schools, commercial area, mosque, and beach area. The second phase consists of a gated community development comprising medium to large residential waterfront units, spread on 14 islands. Real estate developer Nakheel says it has delivered 90 new villas at Jumeirah Village Circle (JVC) in Dubai, UAE, with construction complete and the first residents expected to move in this month. The villas project is among a range of Nakheel-constructed developments at JVC, including 615 villas and townhouses, which were delivered in 2013, and the 1-million-sq-ft Circle Mall, a new retail, dining and entertainment hub due for completion in 2017. 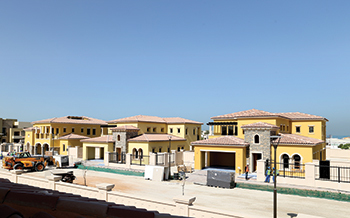 The sell-out Jumeirah Village Circle Villas project – launched in December 2013 and sold for a combined value of Dh275 million ($74.8 million) – consists of 90 homes built in a circular pattern at the heart of Nakheel’s JVC master community. Landscaping work for the project is already under way. The four-bedroom villas each cover 3,655 sq ft, and feature extensive indoor and outdoor living space, including an expansive roof terrace. Nakheel is also bringing 28 landscaped parks to JVC, as part of its commitment to enhancing the community. The key features include a variety of flora and amenities, such as plants indigenous to the UAE, jogging tracks and children’s play areas. Two parks are complete, with landscaping and design work under way on the rest. JVC spans almost 570 hectares, with a projected population of more than 250,000 people. Almost 100 buildings of third-party developers are already complete at the community, with another 320 at various stages of design and construction. As master developer, Nakheel has provided all infrastructure, including roads and streetlights, at JVC, and handed over plots to third-party developers, which construct their individual projects to their own timelines. Reiterating its commitment to contributing to the economic development process in Egypt, retail and leisure pioneer Majid Al Futtaim (MAF) says it has increased its total investments in the country from EGP18 billion ($2.35 billion) to EGP22.5 billion ($2.9 billion), to build new malls, redevelopments and major expansions. In addition, Bejjani has unveiled two new projects forming part of the original EGP18-billion investment plan, including a new City Centre, under the name of City Centre Almaza, with investments of EGP3.5 billion ($459 million), and the major redevelopment and expansion of City Centre Maadi, with a cost of EGP4 billion ($529.3 million). Majid Al Futtaim’s latest investment follows closely after the recent announcement of its five-year investment plan worth EGP18 billion ($2.35 billion). The plan includes developing Mall of Egypt with investments of EGP5 billion ($656 million), the expansion of Carrefour hypermarkets and supermarkets network to 55 branches by the end of 2019 with investments of EGP5 billion ($656 million), and the recent expansion of City Centre Alexandria with investments of EGP70 million ($9.18 million). MAF is currently undertaking feasibility studies for four potential plots to develop neighbourhood centres in Cairo.